At WDMCC we not only believe that youth will change the world in the future, but that they are making the world a better place right now. Juggling school life, work life, and home life can make being a youth challenging. So we are committed to giving youth a place where they can feel accepted and know God's love for them; a place where they can grow in their faith, learning from one another and from mentors; and a place where they can make lasting friendships. 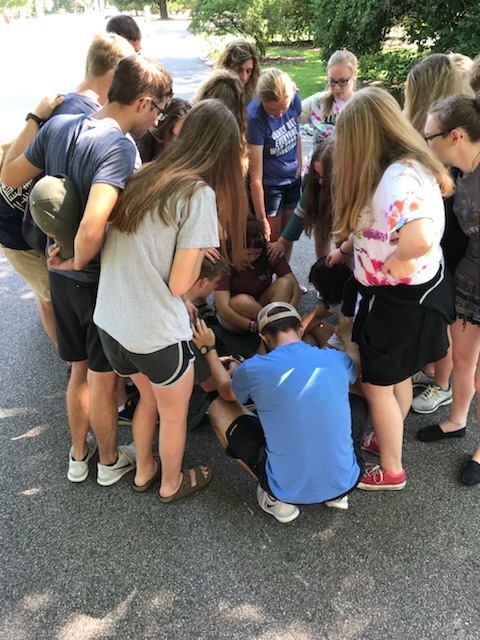 Highlights from this year's CYF trip to St. Louis... A life-changing week of building friendships, serving the community, and being church together. Such an incredible group of youth! Highlights from this year’s Chi-Rho trip to St. Louis! Lots of laughs, lots of fun, and lots of growth... as friends, as disciples of Christ, and as youth who care deeply for all of God’s children! Every Sunday evening from 5:00 - 7:00 pm, youth grades 6-12 gather to encourage one another, to grow in faith and community, and to have fun! Our typical Sunday evening schedule includes dinner, a fun game or activity, a discussion or service project, and a closing check-in/devotional. Click here to download this year's schedule of events. CYF (Christian Youth Fellowship) - For students in grades 9-12, CYF is a community led by a group of caring adults committed to making youth group a fun, formational, and safe place to struggle with the complexities of life and faith. The focus is to help students draw together their heads and hearts, as well as their faith and current life situations. Activities focus on small group discussions, social justice action, use and development of spiritual disciplines, retreats and service projects both in and outside the local community, and fun community-building activities like seasonal parties and hayrack rides. Youth Group meets Sundays at 5:00 pm during the school year. Chi-Rho (Greek letters XP, "Chi" and "Rho," signifying Jesus Christ) - For students in grades 6-8, Chi-Rho is a community in which youth can explore their faith through fellowship, service, participatory learning, and experiences tailored to their interests and spiritual maturity. Activities include drama, local and regional service projects, large group discussions, high-energy games, and exploration of spiritual disciplines. This community is led by a group of caring, supporting, and nurturing adults, and meets Sundays at 5:00 pm during the school year. *CYF and Chi-Rho frequently combine for joint activities. Chi-Rho and CYF Sunday School classes provide opportunities for youth to engage Scripture and some of the difficult questions about what it means to be disciples of Christ in the 21st century. Chi-Rho (Grades 6-8) meets in the Fellowship Hall Bldg. (Room 312). CYF (Grades 9-12) meets in the Youth Room in the lower level of the Sanctuary Bldg. beneath the gathering area. Looking for ways to have fun and connect with other cool youth during Summer Break? Pastors Mark and Luke and sponsors facilitate exciting and engaging programs for all Chi-Rho and CYF youth throughout the summer. Activities include worship, cookouts, games, outings, and discussions that will SEARCH for ways faith matters for today's youth. Contact the church office if you would like to be placed on the email list for these fun events.